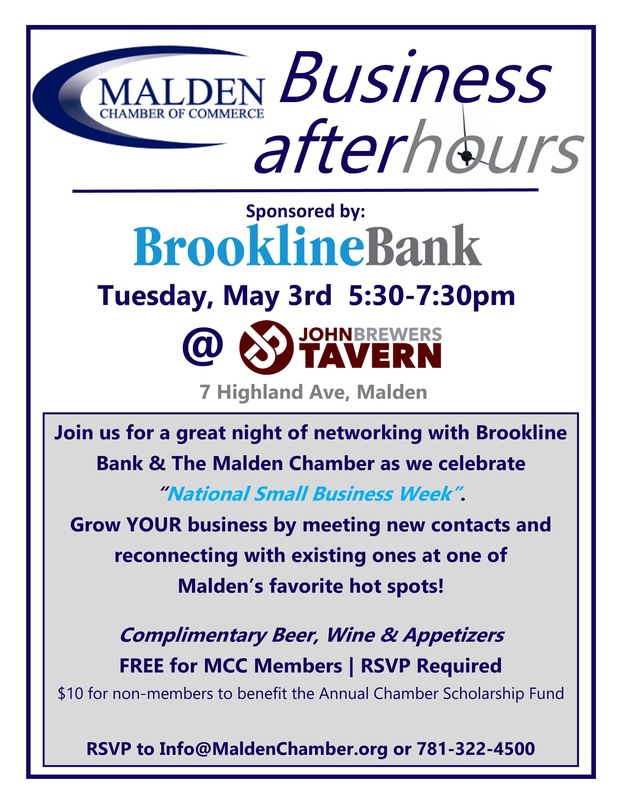 The Malden Chamber and Brookline Bank will be hosting the Chamber’s May “Business After Hours” networking event on Tuesday, May 3rd from 5:30 to 7:30 pm at John Brewer’s Tavern in honor of National Small Business Week. Every year since 1963 the President of the United States has issued a proclamation announcing National Small Business Week, which recognizes the contributions of America’s entrepreneurs and small business owners. This year’s week runs from Sunday, May 1st to Saturday, May 7th across the nation. The Chamber encourages Malden residents to “Shop Local in Malden” during this week and invites its members and Malden business owners to join them in celebration on May 3rd. Sponsored by Brookline Bank, Business After Hours attendees can enjoy complimentary food and drink while connecting with new and existing business contacts at one of Malden’s favorite eateries. “Chambers of Commerce across the country were started by small business owners looking to support and advocate for businesses in their community so we are especially excited to take part in this nationwide initiative while promoting two of our long-standing member businesses, Brookline Bank and John Brewers Tavern.” – Jenna Coccimiglio, Executive Director of the Malden Chamber. Founded in 1891, the Malden Chamber of Commerce is the largest organization dedicated to commerce in the City of Malden. With over 300 members the Chamber represents a wide range of businesses and organizations and is focused on developing the commercial and civic interests of the City of Malden and beyond. For more information visit the Chamber website at http://www.maldenchamber.org.